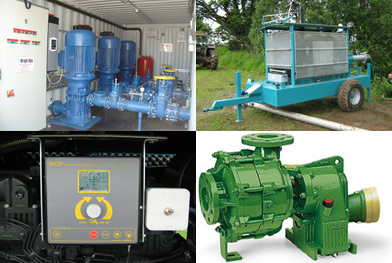 With such a wide range of pumping applications and requirements choosing the correct type and capacity pumping system and control equipment is one of the most important aspects of your irrigation system. Getting it right will result in an energy efficient and easy to operate system which will maximise the return on your investment. Wright Rain has the technical expertise to help you select the most appropriate equipment to meet your particular requirements. From an enormous range of pumps chosen from some of the worlds top manufacturers, we match the appropriate units to the correct size and type of diesel engine or electric motor to provide the required flow and pressure. Models are also available for quick connection to your tractor PTO output. 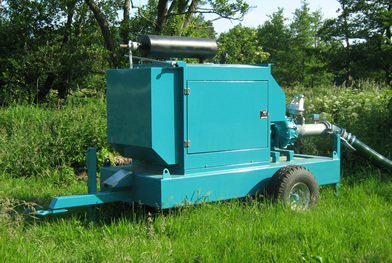 Diesel engine pump units are supplied either on robust skid base units or mounted on wheels for increased mobility. Heavy duty steel fuel tanks are incorporated into the chassis with an integral bund to catch oil or fuel spillage from the engine. To comply with environmental and health and safety directives the engines are protected with mesh guards and a roof canopy or a full acoustic enclosure to minimise noise disturbance. Control systems range from simple manual start with automatic cut out in the event of no flow or abnormal operating conditions, to full engine management systems with automatic speed control to provide a pre-set pressure under changing flow conditions. You can even monitor and control your pumping system from your mobile phone and receive automatic alerts if the unit shuts down unexpectedly. Electric pumping installations are available for water abstraction from reservoirs, boreholes or rivers. Electric installations are usually fully automatic and, combined with reduced maintenance and not having to be refuelled, offer a more efficient solution in many cases. The adoption of variable speed inverter drives for electric motors has also provided tremendous savings in electricity costs by limiting the power requirements on start and only running the motor at the speed required to provide the pressure and flow required at any particular moment.